The TMS9918 is a Video Display Controller (VDC) manufactured by Texas Instruments. 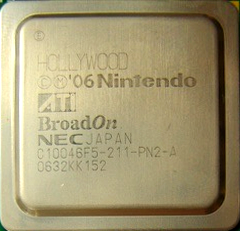 The VIDC1 was a Video Display Controller chip created as an accompanying chip to the ARM CPU as used in Acorn Archimedes computer systems, its successor the VIDC20 was used in the later RiscPCs. The Thomson EF936x is a type of Graphic Display Processor (GDP). The chip could draw at 1 million pixels per second, which was relatively advanced for the year of its release (1982).